If you talk to my cat Tanzie, she’ll tell you I’m a huge animal lover. She’ll also tell you I can be a little overzealous when it comes to her well-being. So naturally enough, I was thrilled when monitoring cameras designed specifically for pets hit the marketplace. There are plenty of reasons to opt for a pet-centric camera if you’re trying to keep an eye on a furry friend at home. Like traditional security cameras, most pet cams offer night vision displays and alert you when they sense sudden or extreme movement or sound. But pet cams also include pet-friendly features such as two-way voice controls, laser pointers and treat dispensers that let you interact with your pet while you’re away. At the forefront of this innovation is the Kickstarter-funded Petcube, founded in 2013 by pet lovers who needed a solution to keeping their pets entertained and themselves sane. The company has developed two interactive pet cams, the original Petcube Camera ($149 on Amazon) and the Petcube Play ($199 on Amazon). The Petcube Play offers a simple, sleek design with two-way audio communication capabilities, a camera with 138-degree views and night-vision technology, and an on-board laser light. 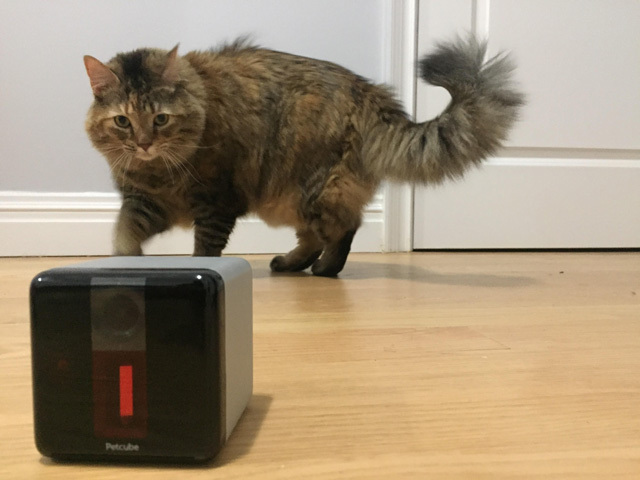 Curious to see how the Petcube Play performs, I got my hands (and my cat’s paws) on one — and we were impressed. Seeming to follow the style lead of Apple, the Petcube Play comes in matte silver, carbon black or rose gold aluminum with black accents. It’s smaller than your average Chihuahua at just 1.3 pounds and 3 by 3 by 3 inches. Its tiny size means you can position it anywhere on a flat surface without being obtrusive. Alternatively, screw it onto a tripod using the built-in mount. The camera leads in interactive pet camera products, offering color and night-vision modes, 1080p HD and a 138-degree viewing angle. A two-way audio stream using the built-in microphone and speaker system lets you talk and bark or meow back and forth with your pet, and a laser pointer lets you interact with your pet even when you’re away. Previous Post Are Cemeteries Obsolete? Next Post Parents: Bath time is a time to pay attention. Here’s why.